It was January 7 of last year when I first heard the sad news. It came from atweet from Sugarfree’s frontman, Ebe Dancel. He will leave his band. During that time, it was still unclear if the band is breaking up or its two remaining members, Kaka Quisumbing and Jal Tuguibao, will continue being a Sugarfree minus Ebe. It was later confirmed in the succeeding days that Ebe Dancel would pursue asolo career and Kaka and Jal would do their own stuff. Sugarfree’s last weeks as a band were spent by doing farewell gigs on different bars and schools. I was fortunate to watch one of their farewell gigs (which, unfortunately, my first time to watch them live) when they performed at the UPLB Feb Fair last February 17. 2011 (Technically, it was already February 18 when they performed). It was a ‘going back home’ performance for Ebe who was an alumnus of UP Rural High School. Together with hundreds of fans, I jumped to their opening song Kung Ayaw Mo na Sa Akin, I joined the crowd in singing Mariposa, and I screamed when they played the crowd-favorite Hari ng Sablay. It was a beautiful night of celebrating the music of Sugarfree. I went home that night with a smile, thankful for having watched Sugarfree live before they part ways; but with a heavy heart because the gentlemen who made the anthems of my College years, would play together for the last time in a few weeks’ time. And so the inevitable happened. 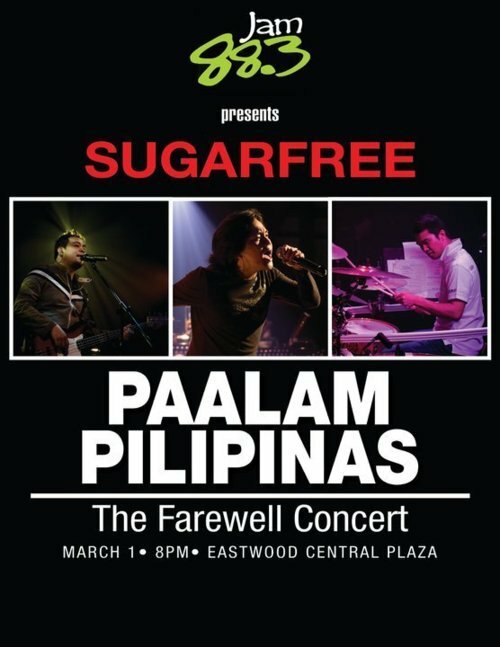 On March 1, 2011, at the Eastwood Central Plaza, Sugarfree bade goodbye to their fans with the farewell concert, Paalam Pilipinas. I was not able to attend the concert but thanks to Jam 88.3 (who played an important role to stage this one) who aired the concert live, I felt that I was also there, drenched in the ran, singing, and shedding a tear for my heroes. During the entire concert, I stayed in my room, headset plugged to my ears, shutting the world. I also have a small piece of paper and a pen, scribbling the title of the songs from their set list. I did not let the other members of the household see me on the verge of tears. I sang. I cried. I smiled. After singing their last song Burnout, I told myself that’s it, we have lost another legend. Maybe because the members are too burned out and they need to rest. We never knew the exact reason of their breakup. It just happened. But at least, unlike others, they formally said goodbye. But as in all ending, there is a new beginning. Life must go on. On August 1, 2011, five months after the farewell concert, Ebe Dancel released his debut album as a solo artist entitled Dalawang Mukha ng Pag-ibig. And as for the two (2) remaining members, Jal Tuguibao continued his studies while Kaka Quisumbing did his own stuff. I am hoping that the remaining two would resurface on the music scene but that thing is yet to happen. From time to time, whenever I feel reminiscing the good old days, I still listen to Sugarfree. I have almost forgotten the farewell concert but not their music. I have almost forgotten the pain of my heroes’ breakup. It has been almost a year and Ebe is achieving great heights as a solo artist. Earlier yesterday, while browsing the news feed of Facebook, I saw a post fromAtTheWomb.com. the music hub of pelicola.tv, about the premiere of a documentary about Sugarfree’s farewell concert. And to add to my excitement, the premiere was yesterday (though they didn’t put the exact time). During the past months, I have resorted to the videos on YouTube to watch Paalam Pilipinas. But I told myself, there must be someone who documented the whole event. It must be shown for the benefit of thousands (or millions) of Sugarfree fans out there. I patiently waited (to the point of repeatedly refreshing the website) until they finally put up the videos at around 10:20 in the evening. And it was worth the wait. 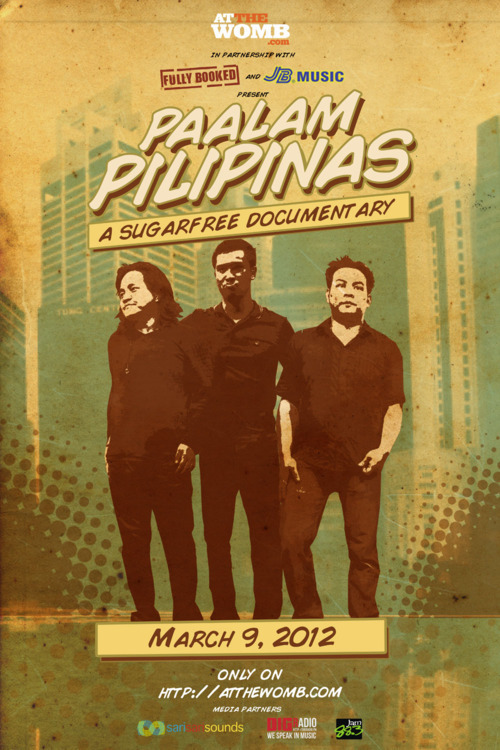 Paalam Pilipinas: A Sugarfree Documentary, tells about the final moments of Sugarfree as a band – from the band members’ respective houses, to the soundcheck, to the events backstage before the concert, and up to the emotional final song Burnout. This is a documentary featuring how the band broke up and not why the band broke up. The documentary is divided into four parts. The first part shows Ebe Dancel and Kaka Quisumbing at the start of the day. Kaka shares his experience on the band’s farewell tour while Ebe shows his preparations for the final show. The second part shows the soundcheck and Jal Tuguibao giving his thoughts on the band’s breakup. The third part shows Jal at his home and what his parents have to say about Sugarfree. It also shows the what was really happening backstage while the crowd was waiting for the concert. The fourth, and probably the most emotional part, shows Quark Henares giving introduction before the start of the concert (and the emotional happenings backstage) and the band’s final performance, Burnout. I watched the documentary twice last night and the emotions I felt during the first time that I watched it was the same, if not more intense, than the first. It’s as if watching over a beloved on his deathbed. It’s as if seeing the love of your life for the last time. It’s as if losing a member of your family. What moved me most, as what I have written above, was the last part. Though not the whole concert was shown in the film, it captured the emotional performance of the group. It also showed an emotional Ebe Dancel when he left the stage after the concert. But what broke my heart most (Spoiler alert!) 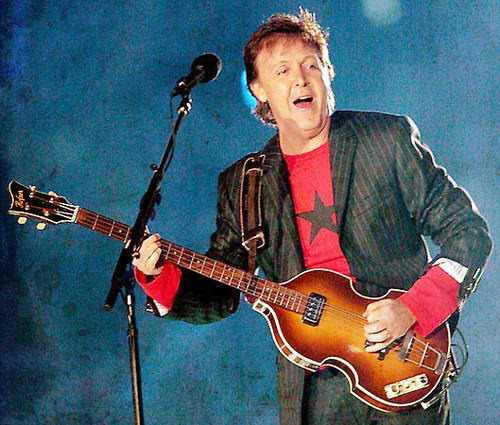 were the lines ‘They were immediately ushered out of the stage after the concert. They parted ways as soon as they were brought to their separate exit points. There was no after party’. With that, I broke into tears. I am no film nor movie expert but I can say that the cinematography was good. It captured (almost candidly, which was good, in my opinion) the emotion of the members and the music fans very well. I also have a problem with the audio on some parts but to sum it up, the documentary captured the essential – how Sugarfree said their goodbye to the fans and how the fans were affected – and influenced – by their legacy. This documentary is a must-watch not only for the die-hard Sugarfree fans but also to those who are affected, in a way, by their songs. Even Ebe Dancel jokingly offered this concert to those who illegally downloaded their songs. It shows us how to properly say thank you and goodbye to the people who supported us and help us be put at the top. I was lucky to grow up with the songs of Sugarfree. 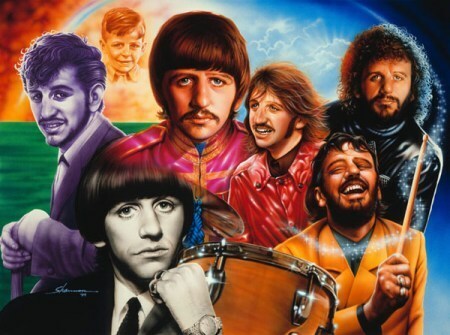 I was lucky to be influenced by their music. Their songs were my anthem of my college years – the period of my life when I was discovering my passion for music. Their songs were simple and honest. They touch the lives of their fans. and in my opinion, that is what a music or a song is all about. Sugarfree may have gone but their music is what keeps them immortal.Listening to their music will help us bring to the happy memories of being a Hari ng Sablay, having a good time at Mariposa, reminiscing our Prom, singing the lullaby Tulog Na, and teling to someone, Huwag Ka nang Umiyak. Maraming salamat Direk King Palisoc at sa bumubuo ng AtTheWomb.com sa dokumentaryong ito. Maraming salamat Ebe Dancel, Jal Tuguibao, Kaka Quisumbing, at Mitch Singson sa musika at alaala. Paalam Pilipinas: A Sugarfree Documentary – I know that you did not read this lengthy post so here’s the link of the documentary. Enjoy. Reminisce. And spread the word. Paalam Pilipinas: A Sugarfree Documentary – Blogger and music photographer Niña Sandejas writes about Paalam Pilipinas and her regret of not following the band as much as others did. Must Watch: Paalam Pilipinas: A Sugarfree Documentary (FHM.com.ph) – Director King Palisoc, in an interview with Gelo Gonzales, talks in detail about the documentary and the last days of Sugarfree. Paalam Pilipinas: A Sugarfree Docmentary (Teaser) – A sneak peek of the documentary from AtTheWomb.com. Of course. 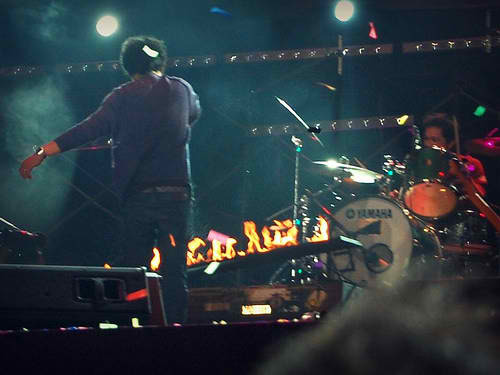 It has been three years since The Eraserheads gave us their final set. Three years after their record breaking concert. Three years since they formally bid us goodbye. Three years after their last bow. Three years after their last concert, and probably indeed their last. Perhaps, this is one of my biggest regrets as an Eraserheads fan. I was not able to watch their two (2) post-breakup concerts. During their first concert at The Fort in August 2008, there were doubts if the concert would push through or not. One of the major sponsors backed out a few days before the concert due to a threat of a criminal case from the Health Department. There were no formal announcement of the selling of tickets. There were no formal promotion on the tri-media – just a press release from one of the major broadsheets. I could have made it to the concert. If only I were not drunk somewhere in Calamba that night. My first attempt to watch them turned out to be a failure. 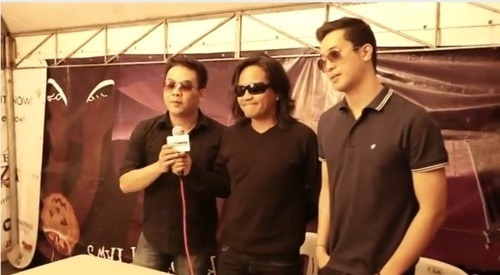 But as we all know, the first concert was cut short due to Ely Buendia’s health condition. After that, there were speculations if the concert would still push through for a second installment. And the fans got what they wanted. The band will work on their ‘unfinished business’. 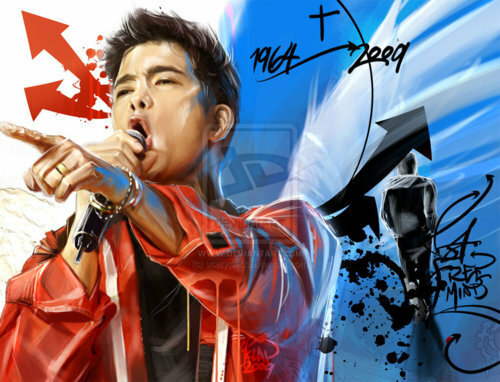 The second concert, The Final Set, happened on March 7, 2009, a day after the Master Rapper died, at the SM Mall of Asia concert Grounds. Compared to the first one, this has a bigger venue, a formal promotion, and more or less a hundred thousand tickets available to accommodate more fans. It is said that this is one of the biggest concerts in our history. It was just a consuelo for those who were not able to attend the concert to watch The Final Set on GMA-7. The network aired it a few weeks after the concert. And I did not waste that opportunity. I watched it with the whole family. 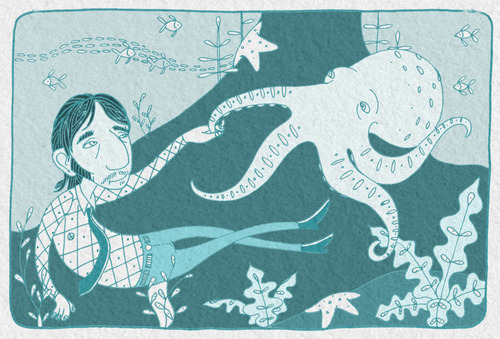 But there is still something lacking, something missing within me. Regrets. 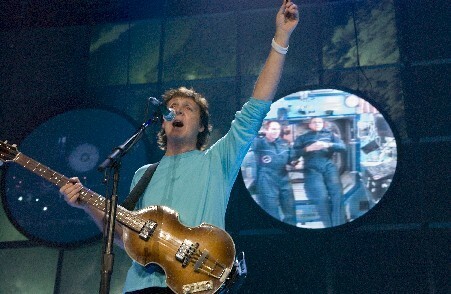 I could have watched them live. And so it happened. 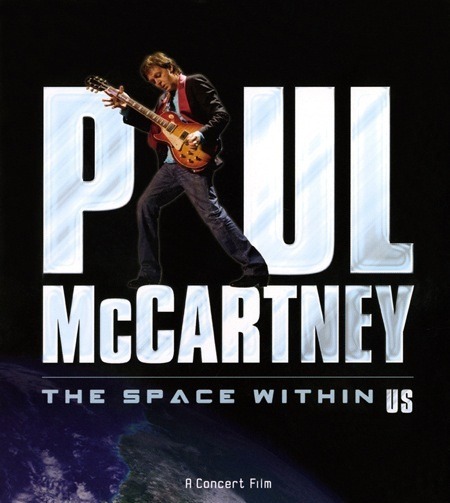 March 7, 2009, Saturday, was an unforgettable event in Philippine music history. The Eraserheads, the music hero and inspiration of a generation, performed and bowed for the last time in front of their fans. It was also during this date that Ely Buendia set flame to the famous “Sticker Happy piano.” You know, the one with the naked Joey Mead from the cover of their album “Sticker Happy”. And for those who are asking the whereabouts of the sticker piano, the last time that I checked, it was at 70’s Bistro (46 Anonas Street Project 2 , Quezon City). Photo courtesy of Sir Chris Linag. For additional information, please read the article by Aldus Santos here. 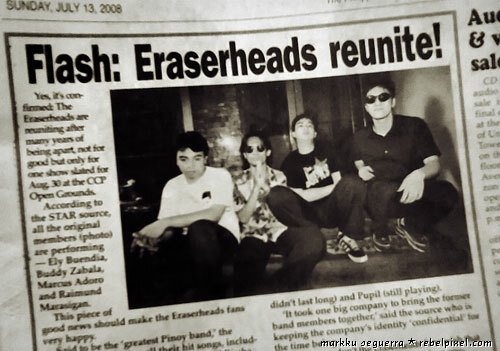 Thank you Eraserheads for being a part of our childhood. Thank you for being the soundtrack of our growing up. Thank you for the good music. 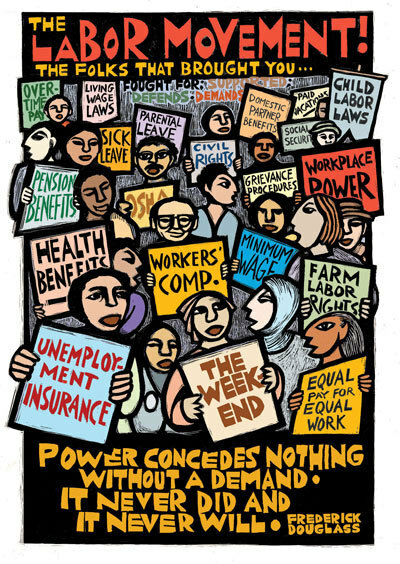 Thank you for being our heroes. Thank you for the memories. Maraming salamat Ely Buendia, Raimund Marasigan, Marcus Adoro, at Buddy Zabala! 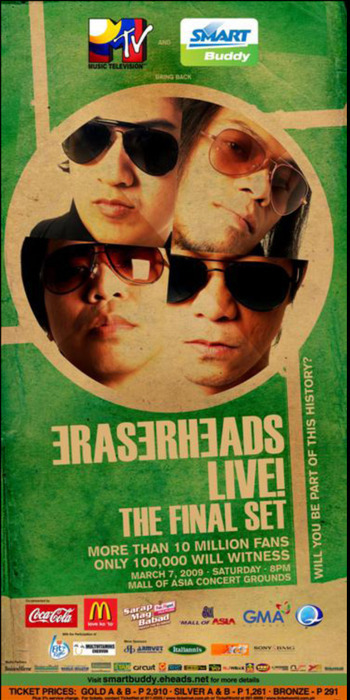 The Eraserheads will never be erased from our heads. That is influence at its finest. It was Friday, March 6, 2009. I was still drained from a week-long written revalida/ comprehensive examinations in Philosophy. Our superiors allowed us to unwind outside the Seminary’s confines, take a breath of fresh air, and forget the hardships of the week. We still have an oral revalida on the Monday to come, but that would be easy. I can ace it, I told myself. I went to Robinsons Place Lipa with some of my classmates. We dined out, ate like a pig, and laughed off the hardships of studying Philosophy. After that, I excused myself and went to Netopia to surf the net and to relax. It was the heydays of Multiply, Friendster, and Yahoo! Messenger. Just like a warrior who survived the hardships of battle, I updated my friends and contacts that I surpassed the first, and the harder part of the Revalida (I could have just tweeted it then but Twitter was not yet known that time). When I logged out my Yahoo! account, I immediately saw an image of the Master Rapper, Francis Magalona, on the news box. (Believe it or not) I just saw the photo, but I did not dare read the headline because I was in a hurry to go back to the Seminary on time. I thought that Francis is going well on his battle against the Big C.
I went back to the Seminary later that afternoon, did my usual stuff, and followed the usual Seminary schedule. After dinner, we went straight to the TV Room for our scheduled TV Viewing and recreation. We tuned in on 24 Orasand were all shocked to learn the news that Francis Magalona passed away. Almost of all of us fell silent, stunned by his sudden demise. After our compline, I went to my room and turn my radio transistor on. Almost all the radio stations are playing Francis Magalona’s songs as a tribute to the beloved Man from Manila. In silence, I said my prayer for the eternal repose of his soul, and expressed my regret for losing another Filipino legend. I saw Mga Kababayan Ko then as an anthem which promotes Pinoy pride and identity along with the songs Ako’y Isang Pinoy by Florante and Tayo’y mga Pinoy by Heber Bartolome (and later recorded and reinvented by the Man from Manila himself). These three songs, together with our regular Monday school anthem Ako ay Pilipino, were my first inspirations to love my country, to appreciate my Pinoy identity, and to be proud of my ancestry. And this was long before Pinoy Ako by Orange and Lemons. But he was gone too soon. Had he not died on that fateful Friday noon of March 6, 2009, he may have personally done greater things for our country and to our countrymen. But as in all war and tragedy, life continues. He may have gone too soon but his spirit, music, and legacy still continue. Thanks to her wife Pia and the rest of the Magalonas, the Francis Magalona Foundation was born. The Francis Magalona Foundation was established to realize in each Filipino a true sense of Filipino pride, personal integrity and a commitment to positive change through awareness campaigns and personal development and skills building programs. Its tagline, Finding a Meaning in every Filipino, is an invitation to every Filipino to ask themselves the significance of their identities as a Filipino. How is it to be a Filipino? How do I promote my pride and identity to the whole world? 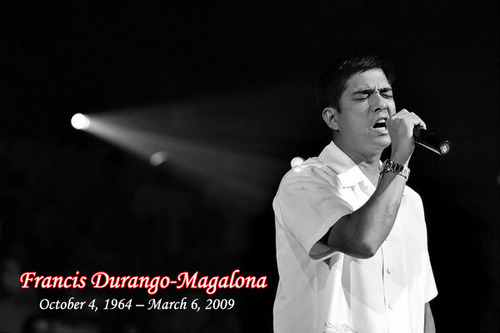 Up to this day, I still shed a tear whenever I see the videos of Francis Magalona’s death on YouTube. I may not know him personally but his patriotism was one of my influences. He is somehow responsible for what I am right now. On the third anniversary of his death, let us remember The Man from Manila who have inspired many by his great music, who have been a good father to his children, who have been a good husband to his wife, and who have been a modern example of Filipino Patriotism. You may have gone Francis but your legacy of music and patriotism will remain in our minds and hearts forever. Mabuhay ka at maraming salamat Kiko!